Food Packages: Start at $45 per platter. BBQ catering from $9.50 per head. The Royal Exchange Hotel has been a landmark venue in Toowong since 1876, and is a versatile venue with an upstairs level able to cater for a variety of functions. 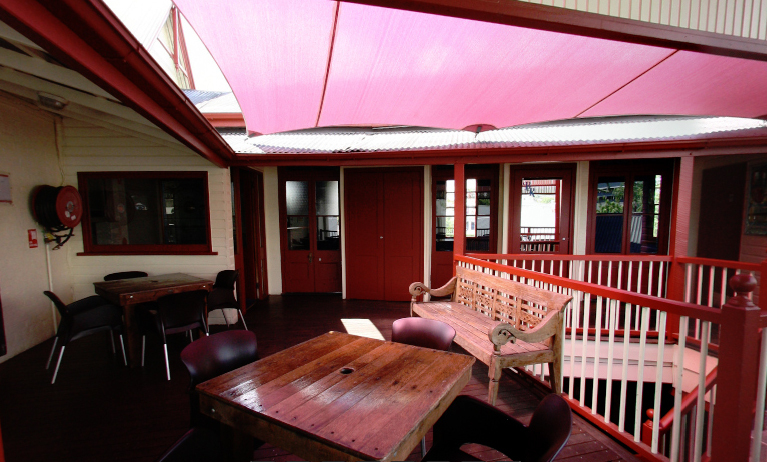 This upstairs function space is called the Deck and Pool Room, and holds up to 100 guests for social functions. With its location close to the University of Queensland, and popular student nights, the venue holds a lot of 21st birthdays and university functions, but is also well suited to other function events in Brisbane such as 30th birthdays, 40th birthdays, 50th birthdays, engagement parties and more. With a separate upper level ensuring your event will be private, you will find the Royal Exchange Hotel a relaxed, open air venue with a great atmosphere. Packages include a wide range of food options, from traditional pub food, to snacks, breads, BBQ packs and great function platters. Underage Guests: Minors are allowed on site, attending a function, if they are under the direct supervision of an adult, until 8pm.